Weekend Historical Happenings: 9/28/13 - 9/29/13 ~ The History Girl! The Princeton Battlefield Society welcomes the public to Revolution at Princeton, on Saturday from 1:00 - 8:15 pm. This year’s event features Artillery Demonstrations put on by the 4th Battalion Royal Artillery and Shakespeare’s As you Like It put on by the Princeton Shakespeare Co., along with music, battlefield life, food, and more. The public is invited to learn about General Washington’s Strategy to win the Battle of Princeton and why the Battle was such a critical turning point of the American Revolution. With hourly demonstrations by the living history 4th Battalion Royal Artillery learn more about the important role of artillery at the Battle of Princeton (1:00 - 4:30 pm). In the evening, the Princeton Shakespeare Company will be putting on an outdoor play, Shakespeare’s As You Like It, a light pastoral comedy and love story, produced by a student group on the Princeton University campus. The play, which is taking place on the East side of the Clarke House (“behind” the Clarke House) will be preceded by music by John Burkhalter of the Practitioners of Musick and poetry by performing artist Joseph Smith playing Philip Freneau, a major poet of the American Revolution (Poetry begins at 4:30 pm, followed by music; the play begins at 6:00 pm). The public is also invited to visit the Thomas Clarke House where General Mercer died, and to learn about plans for its further restoration. Guided tours will be provided of the Battlefield with detail from a recently completed study of original accounts and how the battle progressed. There will also be a special tour using new Battlefield Podcasts. Displays include a Princeton Photography Club exhibit, the Princeton Battlefield Society’s Education Table, the Young Patriots’ Table, an Artifacts Table presented by PBS Board Member Iain Haight-Ashton, the Old Pester, and a Booksellers Table with recommendations on the best books on the American Revolution. Also see living history demonstrations of camp life – cooking, laundry, medicine & herbs, and lap-looming & knitting. In addition, there will be a food vendor, toy soldier vendor, and much, much more. If you are attending the play, please bring a lawn chair and flashlight. The entire day's events are free. Rain date is set for Sunday, September 29. Princeton Battlefield State Park is located at 500 Mercer Street, Princeton, NJ. For more information, visit www.theprincetonbattlefieldsociety.com. The Montague Association for the Restoration of Community History (MARCH) will host a program entitled "The Bridges and Crossings of the Delaware River Valley” at the circa 1790 Foster-Armstrong House on River Road in Montague. Hear Peter Osborne tell tales of the more than 100 beautiful and historic river crossings over the Delaware River. You will learn about the flooding over the centuries, the oldest suspension bridge in the country and the last privately owned bridge on the Delaware. For more information, visit www.montaguehistory.org. 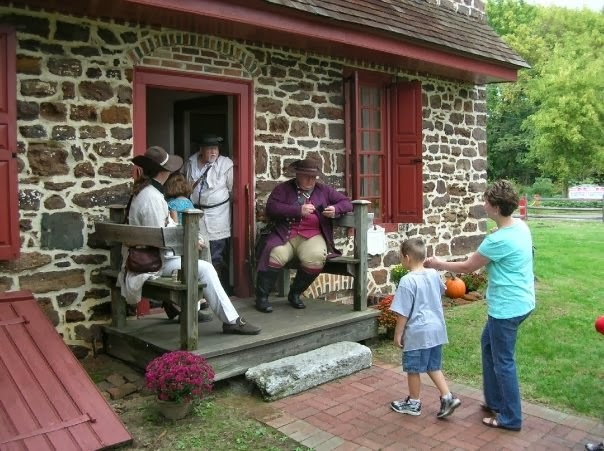 On Saturday from 11:00 am - 4:00 pm, the historic Griffith Morgan House in Pennsauken will host a day of living history! The beautiful hearth of the colonial home will be ablaze as cooking in the manner of our ancestors fills the house with the aromas of history. Skilled crafts people will be carrying on the pastimes that furnished the colonial home with the items of everyday living. Special guest Nicole Salamone will be on-site to talk about medical practices in the colonial home, where wives and mothers ran their era's emergency rooms! She will also bring copies of her historical novella for signing and purchase. Admission and parking are free. Light refreshments will be available. Free tours of the historic home and its museum and library will be offered. The Griffith Morgan House is located on Griffith Morgan Lane, off River Road, near Delair in Pennsauken. For more information, call 856-486-9561. Please join Friends of the Modern School for the 41st annual gathering on Saturday from 12:00 - 4:00 pm at the Brower Commons Faculty Dining Room on College Avenue in New Brunswick. The Modern School/Ferrer Colony was a free school and anarchist community located in the North Stelton section of Piscataway from 1915 to 1953. Every year alumni and friends of the Modern School gather at Rutgers to participate in programs on progressive education, the history of anarchism, and other subjects. Ongoing efforts to preserve the remaining buildings in the Ferrer Colony will also be discussed. Special Collections and University Archives holds the records of the Modern School, which is one of the most used collections. For more information or to register, please visit www.friendsofthemodernschool.org. Allaire Village Incorporated is hosting its annual 1830s Fall Harvest Festival on Saturday from 12:00 noon - 4:00 pm. Celebrate the season with the villagers! Join in cider pressing, an apple toss, militia demonstrations, horse and wagon rides, children's games, and more! Don't miss the exciting Militia Competition with ax throwing, knife throwing, fire-starting and demonstrations. Face Painting and village activities for children of all ages! Admission: $5/Adult, $3 children 5-12 years. Horse and wagon rides additional $7.50/Adult, $5.00 children 12 and under. On Saturday there will be a Civil War Encampment held at West Hill Manor House in Burlington Township. The 6th New Hampshire Volunteers will show what camp life was like for the average soldier. There will also be a cannon demonstration. The event will run from 10:00 am - 4:00 pm at Historic West Hill, 1114 Oxmead Road, Burlington Township, NJ. Admission is $3.00 and includes a tour of the Manor House, whose owners included Susanna Emlen, one of the earliest breast cancer surgery survivors, and Eliza Gurney, friend and correspondent with Abraham Lincoln. For information, call 609-922-4736. Wagon tours of Howell Living History Farm's fall tillage operations will be offered to the public on Saturday from 10:30 am - 3:30 pm. Wagons will leave from the farmyard continuously, touring fields where farmers will be plowing or harrowing with horses and circa 1900 equipment. Tours last 20 minutes and are given free, on a first come, first serve basis. A wheelchair-accessible wagon is available. The Lake Hopatcong Historical Museum presents, "The McGiveneys Return to River Styx" on Saturday at 6:00 pm at the St. Jude Parish Center, 40 Maxim Drive, Hopatcong, NJ. Leading vaudeville artist Owen McGiveney spent many summers in the River Styx section of Hopatcong. For more information, call 973-398-2616 or visit www.lakehopatconghistory.com. Historic Soldiers Weekend is a historical encampment, featuring reenactors, and their equipment, from every American conflict, spanning from the French and Indian War to the Vietnam War. In some instances, both sides of the conflicts will be present, such as the Revolutionary War loyalists and "redcoats", Civil War confederate units, and WWII German infantry units. The re-enactment units will be camping out for the weekend at Historic Fort Mott, living as their ancestors did. This year they will also have Operation Shoebox on hand collecting supplies for our troops overseas, so be sure to check out the web site to find items that you can bring. The Monmouth County Historical Association will host a Civil War reenactors encampment on Saturday and Sunday on the grounds of the Museum, 70 Court Street, Freehold, NJ. The public will be welcome to tour the encampment between 10:00 am and 5:00 pm on Saturday and 10:00 am - 4:00 pm on Sunday. The encampment, organized by the 2nd Rhode Island Volunteer Infantry Company D reenactors group, will feature both military activities and demonstrations as well as craft demonstrations from the Civil War era. According to Antoinette David, of the 2nd Rhode Island, "The reenactors really enjoy engaging the public as they practice their drills and demonstrations and are ready to answer any questions about the life of a Civil War soldier." Ongoing activities will include: live period music by the Camptown Shakers, demonstrations of rug making, chair caning, hat box making, and cooking over the open fire using recipes from the mid-nineteenth century. There will also be displays of toys of the period and of models of naval vessels used in the Civil War. Mary Todd Lincoln will be on hand to talk with visitors about her husband, President Lincoln, and about her experiences. Union and Confederate soldiers will be represented. In addition, a cavalry horse will be housed in the back yard for the duration of the weekend. This will be the last opportunity for tours of the current exhibition inside the museum, Micah Williams: Portrait Artist, as featured in The New York Times, the Maine Antique Digest, The Magazine Antiques, and Art and Antiques. The exhibition closes at the end of the day on Sunday. Admission to both the encampment and the museum exhibition is free. Parking will be available at the Monmouth County Courthouse parking lot. For more information, call 732-462-1466 or visit www.monmouthhistory.org. An old-fashioned country fair reminiscent of the 1890s will be held at Historic Longstreet Farm on Sunday from 11:00 am - 5:00 pm. It takes visitors back in time when neighbors gathered to accomplish work, harvest, and spend time socializing and enjoying each others company. It calls not only for the exhibition of the best products that have been grown and the best needlework that has been done in the community, but also for games, athletic contests and similar features of recreational or educational value. Experience old-fashioned fun as it was a century ago with wagon rides, games and live entertainment. See craft demonstrations that will inspire you to start a new hobby or career. Enter one of many competitions ranging from needlework to baked goods to homegrown vegetables. Each person entering in a competition will have a chance to win a prize ribbon. The Groundbreaking Ceremony for the Grover Cleveland Birthplace Carriage House Visitor Center will be held on Sunday from 2:00 - 4:00 pm on the grounds of the Grover Cleveland Birthplace New Jersey State Historic Site, located at 207 Bloomfield Avenue, Caldwell, NJ. The Birthplace Association is excited to put a shovel in the ground to start the construction of the new Visitor Center, which will be followed by a play titled, "The President Cleveland Story." This play was created and is being performed, by students of James Caldwell High School, under the direction of Mrs. Jensyn Modero. Please RSVP to ataxe@aol.com or call at 973-226-8438. For more information, call 973-226-0001 or visit www.clevelandbirthplace.org. The newest addition to Arcadia Publishing's popular Images of America series is Washington Township, Morris County from local authors Elizabeth Guzenski, Charlotte Arndt, and Juergen Arndt. The book boasts more than 200 vintage images of this New Jersey area. There will be a book signing event on Sunday at 2:00 pm at the Washington Township Historical Society Museum. Washington Township, Morris County is situated on the south branch of the Raritan River. This area was originally home to the Lenape tribe. In early 1700s, immigrants came from Germany, Holland, and England to settle the area now known as Schooley's Mountain and Fox Hill. The rich, fertile soil of the south branch of the Raritan River gave them opportunity for successful agricultural endeavors, the main source of livelihood for many generations. Small villages grew to have their own stores, churches, schools, gristmills, and post offices. The introduction of the Jersey Central Railroad in 1876 helped the quarry and iron ore mine industries flourish. Schooley's Mountain was a major resort due to the mineral springs, with visitors such as Ulysses S. Grant and Thomas Edison. In 1974, Schooley's Mountain County Park was opened to provide recreational opportunities to the community. Washington Township, Morris County showcases the rich agricultural, industrial, and recreational history of this New Jersey Skylands community. Topics discussed include: Middle Valley, German Valley, Schooley's Mountain, Pleasant Grove, Stephensburg, Flocktown, Drakestown, Naughright, Philhower, Unionville (Parker), and Pottersville. The book signing will be held at 6 Fairview Avenue, Long Valley, NJ. For more information, call 908-876-9696. It's the 1930s and unemployment is up to 33%. 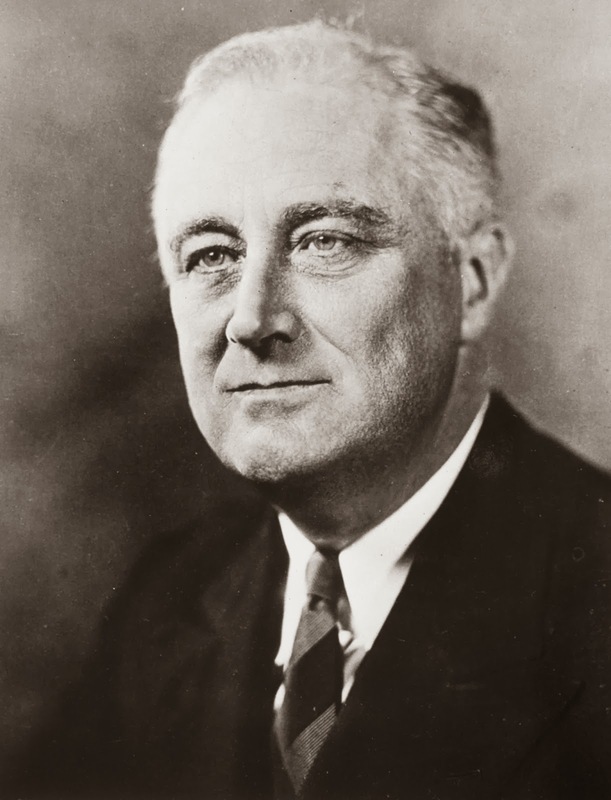 America's president Franklin Delano Roosevelt must rally a nation demoralized by poverty, hunger, housing shortages, and labor disputes escalating to riots. 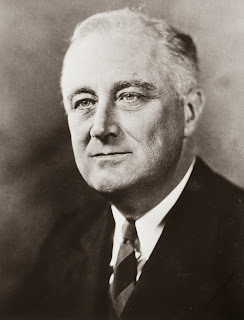 Unable to walk without crutches, FDR was able through the sheer power of his personality, his political skill, and his eloquent Fireside Chat rhetoric to lead America from fear to federal programs that eventually broke through the economic crisis of the Great Depression. Neill Hartley's FDR: A New Deal for America is a collage of personalities from a watershed period in United States history. When Hartley sings "Brother, Can You Spare A Dime?" he expresses the prevailing despair, while Hartley's humor, courtesy of Will Rogers, is a reminder that there is always hope. Hartley leaves his audience with a final speech from FDR, in profile seated in a car with his signature cigarette holder, describing what he envisions for America. We are left to wonder whether FDR, the most powerful man alive at the time, abused the power a grateful nation had placed with him. Or whether he was the right person at the right time to do what needed to be done. This first-person program is free and open to the public. Programs will be held at 1:30 and 3:00 pm at East Jersey Olde Towne Village, 1050 River Road, Piscataway, NJ. Please call 732-745-4177 to reserve a spot. Warren Gamaliel Harding (1865-1923), the 29th President of the United States (1921-1923), returned the United States to a progressive and thriving country after the devastation left by the World War I. 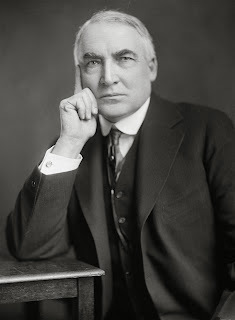 Of special historical interest to Somerset County was Harding's signing of the Knox-Porter Agreement ending the state of war between Germany and the United States. The President signed the agreement on July 2, 1921, in Raritan at the estate of Senator Joseph Frelinghuysen. The Pascack Historical Society (PHS) will shine its light on local architecture when William J. Martin, AIA, chair of PHS' Historical Preservation Board, presents, "A Simple History of Home Construction in the Pascack Valley: Part One" on Sunday at 2:00 pm at its barrier-free museum, located at 19 Ridge Avenue, Park Ridge, NJ. Free admission. Children welcome when accompanied by an adult. Martin, a Westwood resident, owns his own architectural firm in the borough. He is chair of Westwood's Zoning Board and a member of Bergen County's Historical Preservation Advisory Board. Martin will touch on the many factors that led local builders (1850-present) to design and build certain architectural types of homes, including why certain materials were used. He will talk about indoor and outdoor plumbing, ice boxes, transportation access, fire safety, gas introduction, electric lighting, and building and zoning codes through the years. Learn how the unusual topography of the Pascack Valley affected the design and construction of our homes. A question and answer period will follow the talk. Visitors are encouraged to bring photos of their homes to share with the audience. Complimentary coffee and cake will be served. For more information, call 201-573-0307 or visit www.pascackhistoricalsociety.org. The Broad Street Cemetery Association (BSCA) of Bridgeton, NJ will offer two intensive new guided tours of the cemetery this fall. Each tour will feature one section and include recently uncovered cemetery history, colorful stories of the many interesting and sometimes influential people buried here, and discussions of the different styles (and eras) of monuments in each section. The tours will all take place on Sundays: September 29th and October 27th, from 1:00 - 3:00 pm. Rain date will be on the following Sunday in each case (Oct. 6th and Nov. 3rd). All will start at the burial "chapel," central to the cemetery, and only yards from the Broad Street Presbyterian Church, an historic structure maintained in virtually pristine original condition since the 1790s. East Amwell's History Bus Back on the Road! Learn about John Ringo’s buried treasure, the Lindbergh baby kidnapping, and how a signer of the Declaration of Independence wound up hiding in a cave when the East Amwell Historical Society’s history bus fires up its engines for another tour of the town. The historical society will hold the two-hour bus tour on Sunday beginning at 2:00 pm. All the highlights of downtown Ringoes and the hamlets of Reaville, Wertsville and Larison’s Corner will be explored. East Amwell historian and author Jim Davidson will narrate this tour which discusses everything from Ringo’s Tavern where the Sons of Liberty met to debate independence to Dr. Cornelius Larison, educator and proponent of the late 19th-century simplified spelling movement. You’ll also be regaled with one of the freakiest ghost stories you’ll ever hear; it’s so unusual that Weird New Jersey magazine wrote about it extensively in a recent issue. Cost is $10 and seating is limited. To reserve a spot, e-mail Jim Davidson at jdavid4194@aol.com or call 609-466-2592. Celebrate the 226th anniversary of the signing of the U.S. Constitution at the Historic Jersey City & Harsimus Cemetery from 1:00 pm to 7:00 pm on Sunday. Meet Your elected representatives, sign the Constitution, take photos with our "Founding Fathers," view exhibits, art crafts, walking tours of the cemetery and live local musical performances by The Sensational Country Blues Wonders, Scott Wolfson & Other Heroes, Sea of Otters, Leaf Pile, Pocketful, and The Harmonica Lewiniskies! A $5.00 donation is asked to help the volunteers operate and preserve the historic cemetery. The Historic Jersey City & Harsimus Cemetery is located at 435 Newark Avenue, Jersey City. It is a 5 to 10 minute walk from either the Grove Street or the Journal Square PATH Stations. Rain date is October 6, 2013. Please visit www.jerseycitycemetery.org or call 201-707-0738 or 973-204-9888 for more information. Dr. Harold received his MD in 1901 from McGill University, Montreal, Canada, where he met his wife Ruth. He and Ruth were married on January 8, 1900 at St. Mark's Church in Malone, New York. In the 1910 census, Dr. Pittis was living on Union Ave., Lakehurst, with his wife and son Harold, who had received his MD from McGill University in 1937. Lambert Castle, the Victorian-era mansion located on the Garrett Mountain Reservation on the border between Paterson and Clifton, will be home to an exhibit highlighting the Paterson Silk Strike of 1913 now through October 6, 2013. The exhibit, entitled "We Had to be Rebels: Remembering the Paterson Silk Strike of 1913." This year marks the centennial of the landmark 1913 Paterson Silk Strike, which would forever change the face of labor relations in the Silk City. Thousands of workers walked away from their looms to be herded into court rooms and jail cells in a strike that took months to resolve. The exhibit will be open during regular museum hours: Wednesday through Sunday, 1:00 to 4:00 pm. Lambert Castle is located at 3 Valley Road, Paterson, NJ. For more information, call 973-247-0085 or visit www.lambertcastle.org.